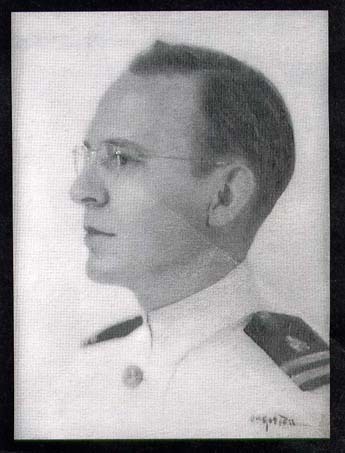 John H. Paul was the dental officer from 1940 until 1941 and was aboard the ship December 7, 1941. He spent most of the attack on the Tennessee after the orders to abandoned ship. He saved a man's life when he carried him to the armor belt of the West Virginia, and Dr. Paul worked on the Tennessee most of the day treating the wounded. Remember Pearl Harbor? Dr. John Paul (’35) was there. Dr. John Paul (’35) received the assignment on his wedding day in August 1940. He and his wife, Virginia, were at their reception when he heard he would serve as the dental officer for 1,500 men of the U.S.S. West Virginia. After a two-day honeymoon, they left for the new assignment at Pearl Harbor, Hawaii. Soon the Pauls would find themselves caught up in one of the pivotal moments of the 20th Century. Today the couple lives in San Diego, the city where they met and married. Dr. Paul recounted his experiences of Dec. 7, 1941, just after the 60th anniversary of the attack that launched the United States into World War II (and mere months after another attack on the nation that roused comparisons with Pearl Harbor). Dr. Paul’s story begins in Osceola, Iowa. Growing up, he thought about becoming an engineer, but pursued dentistry instead. He wouldn’t be the first dentist in the family: His uncle, Dr. E.W. Paul, received a dental degree at the UI in 1911. The lean years of the Great Depression made education a challenge. Dr. Paul waited tables in his fraternity house in exchange for room and board, and he earned $4 a week cleaning a local restaurant. Most importantly, his mother provided $20 each week for tuition and expenses. Thanks to hard work and family support, Dr. Paul graduated second in his class. After dental school, he went to Chicago for an internship at the U.S. Marine Hospital, and while there was one of 1,700 dentists across the country who applied to take the Navy Dental Corps entrance exam. One of about 300 chosen to sit for the exam, Dr. Paul scored first in the region and third nationwide. He resigned his internship and was ordered to duty at the U.S. Naval Academy in Annapolis, Md. “The more I look back, the more I think I made the right decision,” said Dr. Paul of his military career, noting that the service was an attractive option for dentists starting out in the 1930s. The years that followed would take him to Asia, first to the 4th Marine Hospital in Shanghai, China, then aboard the submarine tender the U.S.S. Canopus. That tour completed, he returned to the United States and within a few years married and headed for Hawaii. It was nearly 8 a.m. that Dec. 7. Dr. Paul was in his stateroom bunk aboard the West Virginia when he felt the ship shudder — the first torpedo had hit. He fled the stateroom with only his glasses and trousers. On the way to the battle dressing station, which was already knee-deep in water, he learned that the Japanese attack was under way. When word came to abandon ship, Dr. Paul helped carry an unconscious man to safety, then went to the adjacent U.S.S. Tennessee, crawling across the ropes that connected the two ships. He was the first medical or dental officer to reach the Tennessee’s sick bay, where he treated wounded until the attack subsided. At the end of the day, 2,008 Navy personnel had been killed, 710 wounded and 20 American ships seriously damaged in two waves of attacks. More than 100 perished aboard the West Virginia, which took seven aircraft torpedoes and several bombs. The ship sank into the mud of the harbor, but counter-flooding measures kept it from capsizing. It was raised, repaired and returned long before the war’s end. Needless to say, friends and family on the mainland worried about Dr. Paul’s fate. Virginia had returned to California the previous October, and it was three days before she learned he was safe. Citing his “conspicuous acts of heroism well above the standard to be expected,” the head of the West Virginia’s medical department recommended Dr. Paul for the Silver Star, but he never received the medal. A rear admiral ordered him to testify against an officer accused of intoxication the evening of the attack, but Dr. Paul refused, as he hadn’t seen the man on Dec. 7. In retribution, Dr. Paul said, the rear admiral denied the award. The nomination was submitted again years later, but the admiral lived to be 102 and scuttled it the second time as well. 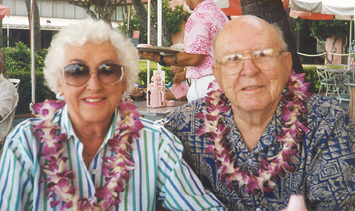 Dr. Paul remained in Hawaii until fall 1942, then returned to the mainland. After an eight-month assignment at the Great Lakes Naval Training Station, he became head of operative dentistry at the Naval Dental School, National Naval Medical Center, Bethesda, Md. In 1946 he was assigned to the Planning Division, Bureau of Medicine and Surgery, in Washington, D.C., then completed a second tour of duty in China, this time with Virginia and two young children. In 1952 he helped establish the U.S. Naval Dental Clinic at the U.S. Naval Base, Norfolk, Va. He served six years as its first commanding officer, overseeing extensive improvements to the dental clinic and its expansion from 17 to 55 officers. During this period, Dr. Paul was elected to fellowship in the American and international colleges of dentistry. Then it was back to San Diego and finally to Pearl Harbor, where Dr. Paul completed his naval career as dental officer for the U.S. Pacific Fleet. He requested early retirement because his mother-in-law was gravely ill in San Diego. Unfortunately, she died in December 1963, two months before his retirement became effective. Dr. Paul then became personnel director for Cimron Corporation — an electronics company established by one of his former dental technicians — a job he held until 1970. Now age 90, Dr. Paul recommends a career in the service as an option that he said offers many advantages over running a business in civilian life. “In the military, you can practice dentistry to the best of your ability knowing that your income is secure,” he said.